It was back to Seaford beach on the bass hunt again last night, although this time I moved a little further East and fished a spot between the Martello tower and ‘The boats’. 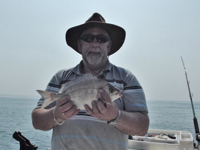 At 7.30pm – an hour and half before low water, I met up with fishing pal, Phil – well I think it was him, I couldn’t really see much of him through the thick fog that had blanketed the area. After confirming his identity and having a quick chat, we decided that we’d stick it out until the 3.20am high water, which would maximise our time with bait in the water and to fish the spread of a whole tide. The sea was flat calm with barely a ripple apart from the small wavelets at the waters edge, which was hardly surprising, seeing as there was bugger all breeze to ruffle it. Did I mention the fog? It was foggy. In fact it was more like a drizzle and it wasn’t too long before our clothing was getting a bit damp through. What was surprising, was how warm it was, so warm that it was down to just a ‘T’ shirt under my floatie trousers. On to the fishing! The plan was to fish live baits throughout the tide if possible, with the backup of big squid baits if no suitable pout of whiting were forthcoming. 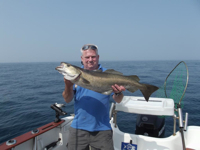 So the first thing was to set up the scratching rod with the usual size 4, two hook flapper baited with small sections of lugworm and flung it out while I set up the bass rod – long link running ledger with a bead above the running swivel. 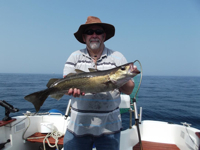 Doing it this way meant I could either clip on a trace with the pennel for using a squid, or leave it off and then use a slider for a live bait – two rigs in one. The first couple of pout that came in really were a little too small and although, I could have used them, I would have preferred something a bit larger, so out went the worms again and the squid stayed on the bass rod. As Darkness proper set in, the bites stepped up and soon we were getting the whiting, although not as many as we would have got further West along the beach. I could have used these as livies but I really wanted pout. Next fish was a snotty eel which swallowed the hook, luckily though, I managed to cut it free before it caused too much damage to the rig, so I got away with only having to tie on a new hook. A few more whiting came in to me, while Phil was getting whiting and pouts. The fog seemed to get thicker even though a very light Southerly started to come up and was enough for me to have to add another layer over the ‘T’ shirt just top try and keep the damp out. At 11.30, Phil and I were having a chat, when I saw my rod tip rattle a few times, then fall still before a lovely little pull down a short time later. I lifted into what was obviously a fish and soon, I had a double shot on the pebbles – a whiting on the top hook and a gorgeous sole on the bottom one – so that was lunch sorted, Anna would be pleased – she do like her soles. 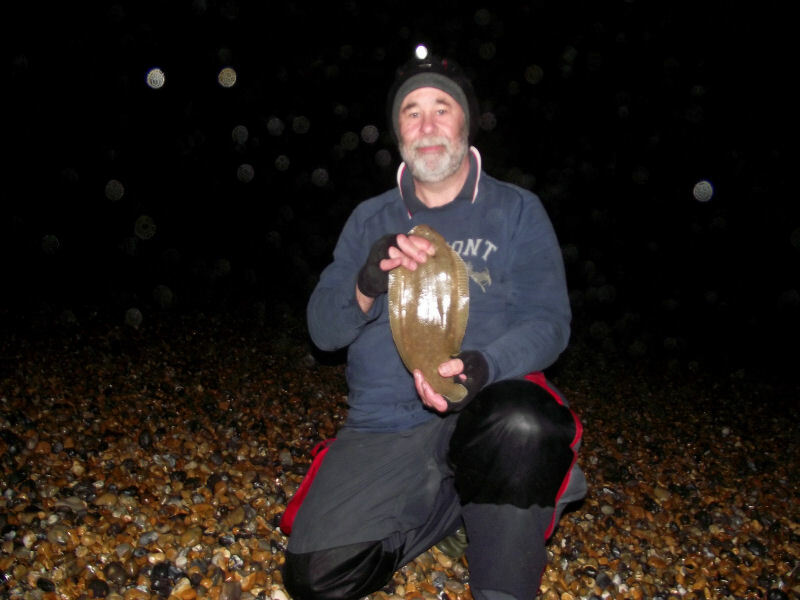 This was actually my first sole of the year and I was beginning to wonder whether I would manage to bag one or not. I have to admit, that I really haven’t targeted them as much as I have before but you can normally bank on one turning up by ‘accident’ while fishing with worm. In the photo, it looks a bit like it’s raining or that there is crap all over the lens but that was ‘the fog’ (reminds me, damn that was a good film). It wasn’t that long before Phil was in with a possible sole, until that it is, it turned out to be a white plastic bag – an easy mistake. Mind you, it was a particularly striking looking bag (Sorry Phil, couldn’t resist it mate). Next up for me was a bass but alas, it were only a tiddler of a schoolie which had picked up the worm. Phil meanwhile, had brought in a small ray. He also caught a small pout that looked like it had gone through the wars, fins all ragged and deep lacerations down both flanks, so something had taken a fancy to it but I guess we’ll never know what it was. The hours went on and nothing else of any note came to the shingle apart from more whiting (one of which was a keeper for me) and we got more and more damp from the fog. Phil called it a day shortly before 3am and as is usual, I just had to stay, even if it was just see over the high water period. 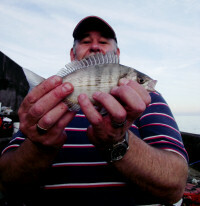 Just after Phil left, I had another double shot but this time it was a whiting and a small bream. 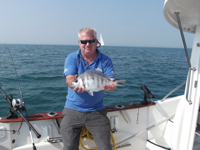 Woohoo – I then had two double shots of suitably sized pout which were added to the bucket for use as live baits. So that I was prepared, I dismantled the scratching rod that had now done its job and packed it all away. I then put a pout on the slider rig, sent it out, sat back, poured a coffee and watched through the gloom for signs of predatory activity. 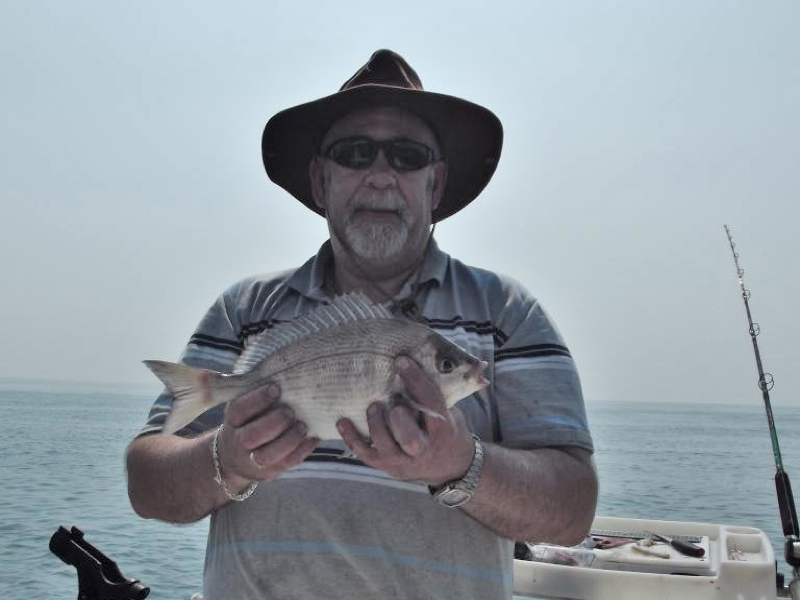 After about 20 minutes, the rod tip started rattling away like crazy, so I stood by the rod, with hands resting on it gently and patiently waiting….bang! Just one hit… but no follow up, no dramatic pull down….nothing. I left the bait out there for another ten minutes before deciding to bring it in – it was dead and looking the worse for wear. Next pout was slid out into the gloom and I sat and drank the last of my coffee. Half an hour went by and … bang!.. again one hit and nothing else. Another dead pout brought in and the substitute sent out in its place. That was to be the last bit of action as nothing else happened until I eventually admitted defeat and headed off home at about 5am. So, no decent bass but an enjoyable session anyway, along with six species and the added bonus of a tasty lunch. After the drenching I got the other night, last night was a complete contrast – in weather and in results. 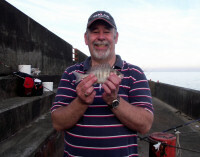 With the calm conditions looking promising, I felt like having a go for a bass down on the East arm of Brighton Marina, so got down there about 8pm with the intention of bagging some mackerel for bait over high water and then to do some scratching until the early hours and fish mackerel head and guts over the 3am low water period. It was a warm, clear evening with no wind and a flat calm, clear sea; as said completely different to the other night. It was nice just wearing a t shirt and jeans instead of the clobber I had previously worn and positively thrilling to have dry hands. 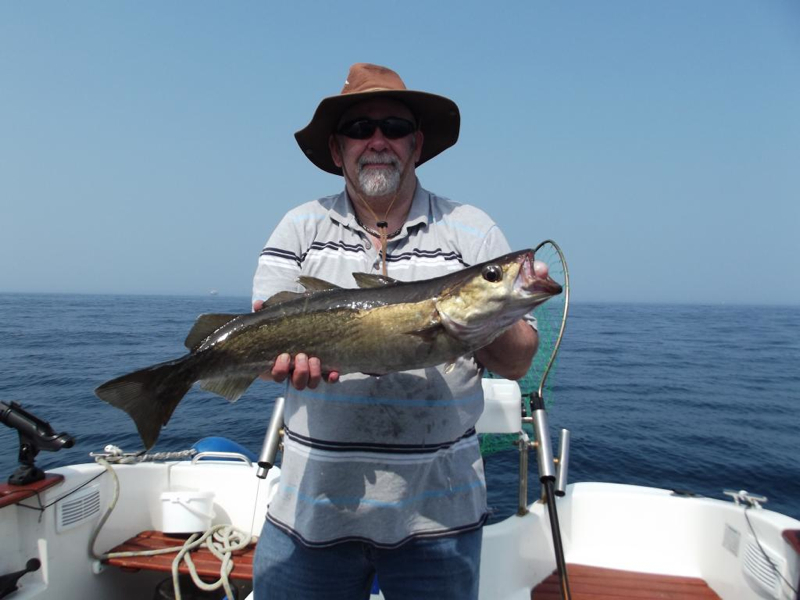 Unlike last time I fished the marina, I had made provision this time and had taken some frozen joeys with me, in case the mackerel didn’t show. Just as well really, as the buggers were conspicuous by their absence and the only fish activity I could see on the surface were probably scad. Anyway, I set up the scratching rod with a size 4 two hook flapper baited with lugworm and chucked it out and almost immediately had a knock which resulted in a small dab – blank saved. Re-baited and then set up the bass rod with the usual long link running ledger, size 5/0 hooked through the snout of a mackerel head and guts which I lobbed out and sat back. By about midnight, a brisk easterly picked up and made it feel a bit chilly in comparison to earlier – certainly enough to put an extra top on. The good thing that came with it was a bit more in the way of cloud cover. The only action coming my way was on the scratching rod, with a few small bream and then on low water, lots of school bass taking a shine to the worm. There was one half hearted attempt at a run on the bass rod about half an hour before low which had the tip buried down for a brief few seconds and then nothing. I gave it until about an hour after low before tiredness set in and I had an overwhelming desire to have a good kip. Looks like Thursday and/or Saturday will be my next outing when I’m hoping for more promising results.